'Jacqueline Postill' is an outstanding form of the species Daphne bholua and brings a splash of cheerful colour to the garden in winter. It has an upright habit and should reach a mature height of up to 2.5m in the longer term, and a spread of up to 1m. The highly-scented purple-pink flowers appear in late January or February - sometimes earlier in mild winters. They are long-lasting. The leaves are evergreen or semi-evergreen, and are long, pointed and broadly lance-shaped. Daphne bholua 'Jacqueline Postill' was raised by Alan Postill from a seedling of Daphne bholua 'Gurkhal' from the famous Hillier Arboretum in Hampshire England, and named after his wife. 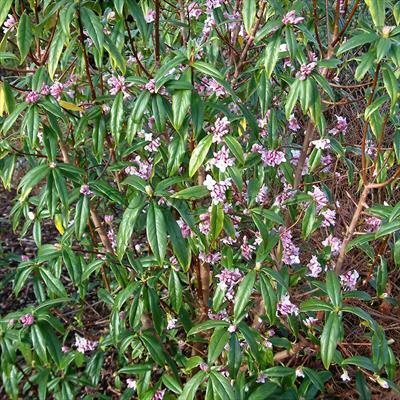 Daphne bholua 'Jacqueline Postill' will grow in most good quality soils. Being relatively slow-growing it is useful for smaller gardens. Although this species originates from the Himalayas and is cold hardy, it will do best planted in a sheltered position. Keep pruning to a minimum. Note that the small colourful black berries formed after the flowers are over are toxic to humans.